If you’re looking for action, adventure and entertaining fun packed with explosions, hen Transformers II is the movie and now DVD experience to enjoy. Sam Witwicky (LeBeouf) is off to college, leaving girlfriend Mikaela (Fox) back home, both believing the whole robot war thing has ended and life will return to normal for the “much in-love” couple. However, when Sam misses his first scheduled chat with Mikaela, she becomes frustrated and surprises Sam in his college dorm room, where he has another girl in his bed, although we soon find out she is anything but a normal girl, and that Sam is anything but guilty. From this point onwards the movie pumps up a notch, as it appears a fragment left over from the destruction of the all-spark remains and is being sought out by a fierce bot even more powerful than the supposedly deceased Megatron. Of course, with any action fantasy film such as Transformers, those who perish have a way of returning to life, and this film quickly follows suit. With the right speaker arrangement, Transformers II provides some good home-veiwing entertainment to enjoy with your pals. It’s not going to win any awards, but Shia LeBeouf shows he can be simultaneously funny and dramatic in one go. He is maturing as an actor and as such, the outrageousness of this film comes along for the ride. Did we ever think the Pyramids were really the resting places for ancient Pharaohs? Highly doubtful. Instead we learn that the ancient robots had created a massive weapon of destruction that lies beneath the stones of the Great Pyramid. 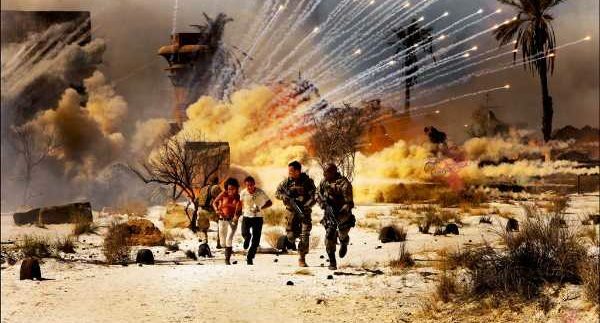 Shot in Cairo, Michael Bay gives us an almost comical glimpse of what the destruction of the pyramids in Giza would look like if monstrous robots were fighting a war just outside the Arab world’s largest city. Sure, we can be critical and pedantic and point out that you can’t really get from Petra in Jordan to the Pyramids in Cairo in less than an hour, but that’s the least of our concerns. If you can put up with the loud sound effects and lack of any real plotline, Transformers lives up to its motto of “more than meets the eye.” Good times. Enjoy. Get the popcorn and drinks ready, gather the friends and have a movie night.